The music of John McKenna, for many years known only to specialist collectors, has recently become widely available on a cassette of remastered 78rpm discs which he originally released in the United States in the 1920s and '30s. The following account of his life and music is a revised and greatly enlarged version of the inlay card notes to the cassette, and is compiled from interviews recorded in 1982 with Mary Flynn, Joseph Mooney, Tommy Gilmartin, Arthur McGrail, Frank Flynn, Joe Liddy, Paddy McGowan, and Hughie Gillespie. It is a grim paradox that one of the factors which aided the remarkable renaissance of Irish traditional music in this century was the depopulation of the Irish countryside and the flight of huge numbers of Irish people, among them their musicians, to the United States. Particularly in the 1920s and '30s, traditional players found audiences in the taprooms and dance halls of America, as well as opportunities to record and broadcast their music: opportunities they could never have had, however accomplished they were, in the struggling Ireland they left behind. 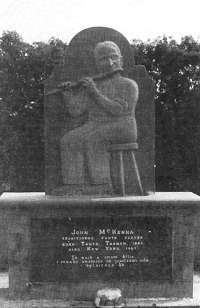 Among the most significant of these emigrant musicians was John McKenna, a master traditional player whose remarkable achievement was, through his recordings, to establish the flute as a major instrument in Irish music. The recent reissue by the John McKenna Traditional Society in his native Leitrim shows that age has not dimmed the brilliance of his driving, extrovert, rhythmic style. His playing, more than ever today, exerts a huge influence on traditional music. His settings have been reproduced with great fervour recently by De Danann, particularly on their Star Spangled Molly album. Frankie Gavin's subsequent solo flute album, 'Up and Away', is designed specifically as a McKenna tribute: the title derives from one of McKenna's best known polkas. Among other musicians who are exponents of the McKenna style or who have prominently featured McKenna settings on their recordings are Willie Clancy, Charlie Lennon, Seamas Mac Mathuna, Mick O'Connor, Seamas Tansey, and many others; Matt Molloy of The Chieftains has fused many strands with McKenna's to produce his own unique blend. In the Ireland of the turn of the century, folk music revivalists saw themselves as antiquarians whose job was to document the last throes of a dying culture: in a memorable phrase they spoke of 'music of archaeological interest'. Across the Atlantic, however, where millions of Irish flocked, the outlook was less hopeless. A Chicago policeman, Francis O'Neill, collected the music of the restless Irish in his city: his 1907 collection of dance music, '1001 Gems', was a popular success among musicians and was regarded by them as their bible. The repertoire of Irish folk instrumental music was, for the moment, standardised in O'Neill's book; it remained to establish a standard style in which this repertoire could be played. A new mode of communication, the gramophone, provided this musical idiom for musicians to emulate. On the ethnic labels of American record companies a living, breathing style came into prominence, a style which, by its energy, expressiveness, and excellence of technique, became a broad, dominant musical dialect for Irish traditional dance music. This style which came to dominate Irish traditional music for many decades was led by a brilliant school of emigrant musicians from County Sligo and the surrounding area, which included McKenna's birthplace, an underprivileged region in north Connacht in the west of Ireland. 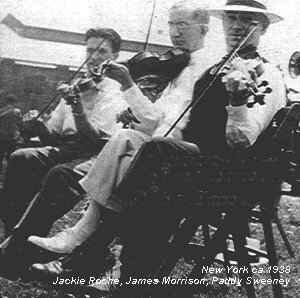 This Sligo style was spearheaded by fiddle players Michael Coleman and James Morrison; John McKenna was the pre-eminent flute player among these musicians and, in fact, was the only flute player to make a major impact on this fiddle-dominated movement. John McKenna was born on January 6th 1880. His father, Pat, was from Arigna; his mother Cecily Ward, was from Tents, Tarmon, midway between Drumshanbo and Drumkeeran, small towns in north County Leitrim, and here, on the shores of Lough Allen, was where the McKenna family lived and where John was born. 'The last place that God made' is how that scenic and rugged area is described by the farmers who struggle with its rocky land. One feature, unusual for rural Ireland, which gave an economic viability to this locality which nestles among the Arigna Mountains was that it had for centuries been a coal mining area. It was with the local coal mining company that McKenna found his first job. Though beside the Sligo area, and overshadowed to some extent by the rich musical tradition of its neighbour, Leitrim preserved a separate identity and tradition based largely on the flute. Irish country flute players generally play the concert flute: a transverse, wooden, open-hole, semi-keyed, pre-Boehm system instrument, pitched usually in D. If a local musician's sphere of influence at the turn of the century could be approximately defined as the distance he or she could walk and return in one day, about 10 or 12 miles, the whole Sligo-Leitrim style could be said to come from roughly within the human compass of Drumfin, near Riverstown, the birthplace of James Morrison. In this pocket, where three counties Sligo, Leitrim, and Roscommon intersect, there was an extraordinary wealth of musical activity in McKenna's youth. In isolated country areas like this the main form of indoor musical entertainment was the house dance - a night of music and dancing in a private house, a regular social occasion often rotated among the houses in a locality, sometimes held in honour of a special occasion, for example, at harvest time or for an 'American wake', or party for an intending emigrant. These nights of music and set-dancing 'til dawn were the hub of the tradition, where musicians learned and plied their trade under the strong discipline of playing for the sets and half-sets, where music was absorbed from the most senior or the most able among them, and where young musicians did their apprenticeship. In McKenna's immediate locality, the concert flute held sway at these gatherings. 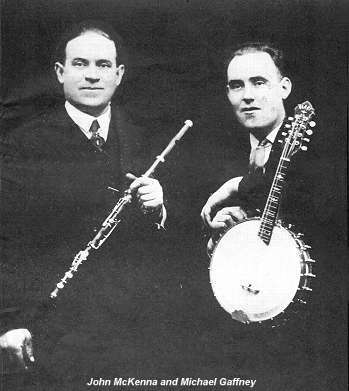 Local flute players from whom McKenna is known to have learned music were Hughie Byrne and Jamesy McManus. Other Druskeeran players at the time were John Frank Doherty and Francie Rourke. Players who later, like McKenna, emigrated to America were Mick Conlon, and Stephen Fallon from Drumkeeran, of a musical family known for identification as the 'Ruther' Fallons. Stephen's son, Frank, was later to accompany McKenna on piano on recordings, and, later again, Frank and his brother Pat, a fiddle player, were to set up the Celtic Record Company, and also the label Irish Records, which in the late 1940s released the records of Charlie Higgins, a Leitrim flute player greatly influenced by McKenna, and Jack Dolan, fiddle player and flute player, also from Drunkeeran. Another notable family of local musicians were the Gallaghers of Creevalee: Pat, who played flute; Peter, who played fiddle; and Michael, the best known of them, who played flute and uilleann pipes and later made recordings in the States. From near Creevalee came the accordion-player Margaret McNiff, who later, using her married name, recorded in America with her group, the McNiff-Locke Instrumental Trio. Slightly further from Tarmon, 20 miles away in Aughavass, were Edward Rourke and Thomas Canning, of whom John Blessing, a present-day Leitrim player, heard tell from his father, also a flute player. A well-known local fiddle player was Tom Smith, or 'Tom Hair-oil' as he was known, who was frequently visited by his cousins, Mary Travers, who played fiddle and accordion, and her brother, Hugh, a flute player who later recorded with the Dublin Metropolitan Garda Ceili Band. McKenna was a sporting youth who played soccer and tug-o'-war. John McKenna married a local girl, Mary Jane Keaveney, in St Brigid's Church, Drumkeeeran, on September 13th 1909, and their honeymoon was spent in Scotland where the new bride had previously worked as a nurse. Access to Scotland was easy as there was then a train connection at Arigna to Belfast, with a boat and train connection to Edinburgh; though the fare was prohibitive, the single journey costing the equivalent of two weeks wages for a coal miner. The newly-married couple set out for America immediately on their return from Scotland, sailing on the SS Baltic, and arriving in New York on October 31st 1909. They settled at 115 East 97th St, and had nine children, of whom six survived - Madeline, Mary, Catherine, John, Tommy and Charlie. In July 1920 McKenna joined the fire patrol section of the New York Fire Department, working alternate day and night shifts on fire salvage duties. This was his employment at the time of making his first records in 1921, and on some early releases was billed as 'Firepatrolman John McKenna', in line with a fashion that styled his partner on one record 'Fireman Barney Conlon', and other Irish performers of the day 'John Griffin, the Fifth Avenue Busman' and 'Patrolman Frank Quinn'. During this trying period of his children's extreme youth, McKenna found in music a consolation that never failed him. John McKenna's recording career spanned a period of 16 years, from 1921 to 1937. During that time he recorded 60 sides for the American companies New Republic, Vocalion, Gennett, O'Byrne-DeWitt, Columbia and Decca. Advances in recording technology with the introduction of electric recording in the late 1920s coincided with McKenna's peak as a flute player. He had a remarkably long career: failing wind often terminates a flute player's performing prowess at an early age, but McRenna continued to record till he was almost 60 years of age. The Irish in America participated eagerly in the upsurge of interest in ethnic music of all kinds after the First World War, an interest reflected in the sales of gramophone records and heightened, in the case of the Irish, by the news of great political change at home. The founding of the O'Byrne DeWitt record company dealing specifically in records of Irish interest, was part of the wave of nationalist feeling which followed the insurrection in Dublin in 1916. The first records by McKenna to arrive back in Leitrim from America about 1922 were on the New Republic label, bearing on them the green, white, and orange tricolour of the new Irish Free State, reflecting Irish-American interest in the new status of the 'old country'. McKenna's music was predominantly for dancing, hearty music with a fine lift imparted to it by his rhythmic drive. His short, well-flavoured phrases are separated and set off against each other by strategically placed breathing rests; notes are punctuated by glottal stops rather than by gracenotes. The whole effect is one of great rhythmic attack, delivered with great punch, a far cry from the legato, smoothly-presented approach favoured widely today with its wealth of finger ornamentation. As well as the buoyancy of his native style, his music overflows with the spirit of optimism so typical of the affluent America of the 1920s. John McKenna was responsible for bringing many local Leitrim tunes into the standard repertoire, and many tunes we now hear universally, like Lucky in Love which provided the title for a recent album by Leitrim fiddle player and composer Charlie Lennon and flute player Mick O'Connor, and The Sailor on the Rock in all probability owe their currency to his records. Even the ever-popular reel The Sailor's Bonnet, which seems to pop up at every session of Irish music these days, was comparatively unknown among players before the recordings made of it by McKenna and James Morrison in duet and later, of course, by Michael Coleman. McKenna never forgot where he came from: he recorded tunes bearing Leitrim place-names in their titles whenever he could: Leitrim Town, The Corry Boys, Arigna's Green Vales. The hornpipe McPartland's Style commemorates a champion stepdancer, a shoemaker by trade, from Ballyfarnon, County Roscommon, where competitions still take place for the best dancer to batter out a reel on a door un-hung for the occasion. The tune of a local song, Fire Away, You Devil You, provides a jig on another disc (Gennett 1925). The reel set most commonly associated with McKenna's name is Colonel Rodger's Favourite (earlier recorded by Frank Quinn, the County Longford accordionist/fiddle player who was a New York policeman) and The Happy Days of Youth. In fact, the titles of these tunes had long been forgotten among musicians, and they had been referred to simply as McKenna's Reels, till Frankie Gavin's recent correct renaming of them for his 'Up and Away' flute album. Though the Sligo style dominated Irish music of the period, that is not to say that it was a unified effort or that all was sweet accord in the Sligo camp. Michael Coleman, the supremely expressive player of lyrical sweetness and sadness, and James Morrison, the master of strong rhythm and impressive technique, were bitter rivals, with New York Irish musicians sometime being forced to align themselves on one side or the other. McKenna, however, did not take sides: though he recorded with Morrison, he was a friend of Coleman's. It was 'The Dunmore Flash', Tom Morrison, no relation of James, a flute player from near Glenamaddy, in the Dunmore area of County Galway, who accompanied Coleman on his fiddle-flute duets. Flute records were made in New York also at this time by John Griffin, from near Ballaghadereen, County Roscommon, who played flute breaks between stanzas of his comic songs; Tom Doyle, a flute player from County Mayo, who recorded some duets with Michael J Cashin, a Leitrim fiddle player; and a flute player from County Cavan and his group, known collectively as John Sheridan and his Boys. Though Coleman and McKenna did not record together, the common background which they shared can be seen in the number of pieces which were recorded by both. Apart from The Sailor's Bonnet, McKenna's The Ballroom Favourite (Decca 1934) was a version of the tune recorded by Coleman as Mrs Kenny's Barndance; and Clancy's Dream (Columbia 19281 was recorded by Coleman as Paddy Clancy's. McKenna recorded many polka selections, particularly on his duet recordings. Polkas, among the most recent dance forms to enter the Irish tradition, are regarded these days as being exclusively the property of the south-west of Ireland, in Kerry and West Cork. 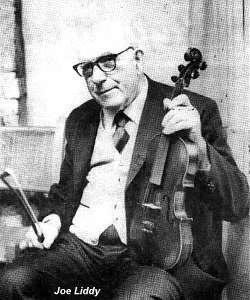 The existence also of many fine polkas in the repertoire of Michael Gorman, the late Sligo fiddle player who spent most of his life in London, reminds us how much more widespread these tunes were earlier this century than they are now. How arbitrary the titles of these tunes were is shown by the fact that McKenna recorded the same polka twice with different titles, The Merry Girl (Decca 1934), and The Kiss Behind the Door (Decca 1937). A favourite device of McKenna's was to mix tunes in 6/8 time (double jigs) and in 9/8 time slip jigs) in one selection: Clancy's Dream, double jig, and Leitrim Town, slip jig (Columbia 1928); and Dever the Dancer, slip jig, and Connie the Soldier, double jig (Decca 1934). This practice was not unknown at the time: the only jig selection recorded on disc by the great uilleann piper Patsy Touhey 1865-1923) also mixed slips and doubles in the same selection. The duet recordings of John McKenna contain some of the finest Irish dance music from the period. He was an enthusiastic duettist: James Morrison the fiddle player was his most celebrated recording partner. The McKenna-Morrison duets are still unequalled for sheer life, rhythm, and their amazing rapport, urged on by excellent piano backing. As well as four fiddle-flute duets, they recorded two sides featuring Morrison on tin-whistle. James Morrison was an accomplished and literate musician who absorbed the music around him very quickly. James Morrison died in New York in November 1947. Michael Gaffney was from Mullaun, Arigna, near McKenna's home area. The banjo was an instrument then new among Irish players, which Gaffney took up after he went to America. He also played fiddle, flute, and accordion. Michael Gaffney died in New York in October 1972. Eddie Meehan, from Kilrushister, Templeboy, County Sligo, played accordion and flute, and accompanied McKenna on second flute on their duet recordings. Hughie Gillespie, the Donegal fiddle player, recalls a memorable meeting of giants at a period when Michael Coleman was staying with him. Eddie Meehan also played and recorded with McKenna as a member of the Rosaleen Quartet, which also included Larry Redigan on fiddle and Frank Fallon on piano. Meehan died in New York in October 1946. Barney Conlon, known locally as Bernie, was born in Ballyfarnon, County Roscommon, again near McKenna's home neighbourhood. Playing fiddle, he accompanied McKenna on two early recordings. Conlon died in New York in 1946. McKenna's records invariably have piano accompaniment, in keeping with the practice of the times. Unfortunately, this accompaniment could occasionally be seriously unsympathetic, and did much damage to the music of the period: particularly unfortunate in this regard was Michael Coleman. However, all in all, McKenna escaped lightly from this scourge of the age, and the standard of accompaniment, particularly on the duets, is often excellent. His piano accompanists included Della McMahon, Paddy Muldoon, Frank Fallon, John Muller, and A P Kenna. McKenna's discs made a tremendous impact when they filtered back home. The advent of a John McKenna record was an eagerly awaited event in his native area. McKenna's records stirred deep feelings among the comrades of his youth left behind in Leitrim. It was unusual for musicians of the period ever to return home to Ireland, even for a visit: Coleman never returned to his native Killavel or Morrison to Drumfin. Among the exceptions were Hughie Gillespie and Tom Carmody, the Kerry accordionist who was a member of the James Morrison Quartet, both now at home in retirement. Paddy Killoran, the Sligo fiddle player, made many visits back to Ireland. Still fondly remembered in his home area is a lengthy visit home by McKenna in 1938. By this time his recording career was over, his family was reared, and he was a comfortable widower living with his daughter. Unfortunately he was to encounter the bitter contradictions of Irish life which made that country a byword for neglect of its own cultural resources at that time: a warm welcome from the musical confraternity, but a frosty reception from those in power in press and radio. In Leitrim his visit was unheralded by the local newspaper and at a day of sports and athletics which he attended he was not asked to play. However he was welcomed by those who had cherished his records and revered his music. He impressed people as an unassuming man who was natural and unaffected in his ways. In Leitrim, McKenna visited the Leydon family, proprietors of the colliery where he had worked 30 years before, and had a night of convivial music-making there in the company of Tommy and Joe Liddy, Leitrim accordionist and fiddle player, well-known in Ireland through their records with the Belhavel Trio, who were themselves on holiday from Dublin. During a stay in Dublin on this visit, musicians with Leitrim and Sligo connections gathered together in Clontarf to greet him and play with him: the Liddy brothers; John-Joe Gardiner, Sligo fiddle player and flute player who was a friend of James Morrison; John-Joe's sister, Mrs Barrington, a fine fiddle player Frank O'Higgins, the fiddle player from the Midlands well-known through his records and broadcasts; and Tommy Gilmartin, a fellow-Drumkeeran man who played flute and uilleann pipes. Joe Liddy was involved in some broadcasting with the national radio station, Radio Eireann, at the time. But eventually, on the evening of Thursday 25th August 1938, McKenna did get to make a broadcast with the station, from the same room in which, only a year previously, Neillidh Boyle, the Donegal fiddle player, Philip Martin, the uilleann piper, and others had recorded the first batch of traditional music discs ever made at home in Ireland by the EMI group of companies. McKenna's broadcast seemed disappointingly short to his fans, one of whom, Tommy Gilmartin, was a bus driver at the time. If McKenna's followers were unhappy with the duration of the broadcast, they were more than happy with the playing itself. But there was another disappointment in store for McKenna, connected to a deeper and more personal aspect of his visit. John McKenna never returned to Ireland again. He died on November 26th 1947 in the home of his daughter Madeline in New York, and was buried in Calvary Cemetery, in Hawthorne. After his death his instruments were donated to a therapeutic institute for handicapped children. McKenna's memory is actively cultivated by the John McKenna Traditional Society, a group of local people in his home area who have combined in an admirable piece of community co-operation. In 1980, the centenary of his birth, they unveiled a fine memorial in his honour at his birthplace, Tarmon. Every year, a music festival is held at the monument, with special emphasis on the local flute playing style which is still thriving in the hands of Packie Duignan, Josie McDermot, Patsy Hanley, Tommy Guihen, Mick Woods, and many others. In 1986 the Society released a cassette of remastered reissues of McKenna's original recordings, and without doubt, other challenges and achievements lie before them. John McKenna was a prime mover in one of the most vibrant chapters in the history of Irish traditional music. He left behind a body of recordings which confirm his stature as a major figure in this century. Leitrim people are justifiably forthright in articulating their pride in the achievements of John McKenna.